Phoenix. DATE PALM. (Greek word for the date palm.) Palmae. Some seventeen species of pleonanthic, dioecious palms. Stems solitary or clustered, clothed with peristent leaf bases or bare and obliquely scarred, sometimes absent. Leaves pinnate, induplicate, marcescent, sheath fibrous; petiole channelled above, convex beneath; pinnae single-fold, regularly spaced or clustered along rachis, emerging brown-floccose or waxy, becoming scaly, lowermost pinnae reduced to spines. Inflorescences interfoliar, erect to arching, branched once; lower bracts glabrous or floccose, occasionally bivalved, upper bract inconspicuous; rachillae pendent, bearing solitary, cream-yellow or pale orange flowers; male flowers with three petals, valvate, exceeding calyx, stamens six, pistillode usually absent; female flowers globose, petals overlapping, up to two times the length of the calyx, staminodes 6, carpels 3. Fruit oblong-ellipsoid to ovoid, one-seeded, yellow, orange, green, brown or red to blue-black; epicarp shiny, mesocarp fleshy or pasty; seeds one, with longitudinal groove. Africa, Asia. Z9. Phoenix dactylifera, the date palm, has been cultivated for at least 5000 years. Although its origins are obscure, it seems likely that it occurred naturally in North Africa and Western Asia, and it now grows in arid zones from Morocco to Pakistan. The date is a very important crop in arid zones - the fruit is a staple food for long periods of the year. The wood and leaves are used in construction. Fibre from leaf and bark is used in rope-making and basket-making, and when woven with camel hair it provides strong cloth for tent making. Dates are grown commercially in Saudi Arabia, Iran, Egypt and Iraq, the latter being a major exporter, and in the US, in Arizona and California. The capacity of Phoenix dactylifera to subsist with little care, on saline subsurface water, and in very hot locations, has led to its being replanted in Israel and the Jordan valley, where other crops would be difficult. Commercial fruit production relies on long hot summers with low humidity but little rain and copious irrigation, since rain may spoil pollination and cause rot in young fruit. Fruit set is ensured by hand or mechanical pollination and the quality of the fruit by limiting yield to about 50kg per plant. Pollen can remain viable for several years. Fruits are hand-picked and ripened by incubator. Large yields are not obtained until plants are five to eight years old and can range from 20-100kg per annum. In tropical, subtropical and warm temperate zones such as California, Florida and the south of France, Phoenix dactylifera is a valuable ornamental, an admirable subject for avenue plantings. Phoenix rupicola, a slender and graceful palm, and Phoenix canariensis are also decorative ornamentals. Alongside Phoenix sylvestris, the wild date (grown in India as a source of sugar and molasses), these are the most frost-hardy of the genus. They withstand fun sun, dry atmospheres, and are tolerant of a wide range of soil types. In cooler temperate zones, grow these species in a glasshouse with a minimum temperature of 10-13ºC, and other more tropical species with a minimum of 17ºC; use a well-drained, fibrous, loam-based mix, and water plentifully in the growing season. A dilute liquid feed at fortnightly intervals is beneficial. Remove basal suckers to create taller single-stemmed specimens. Large specimens are often used for interior decoration. Phoenix rupicola is the most commonly grown, but the small stature of the rather more tender Phoenix roebelinii makes it a desirable container specimen. Propagate from seed, after soaking for 24 hours, with a bottom heat of 21-27ºC. Phoenix dactylifera may be grown outdoors in mild areas, but seedlings will require winter protection. Propagate suckering species by offsets. Differs from Phoenix reclinata only in the urceolate female calyx and hard endocarp. Ethiopia. Trunk to 30cm diameter, squat, ovoid, usually buried or obscured. Leaves to 90cm, waxy; pinnae to 45 x 1cm, few, in clusters of 2-4 along rachis, marginal veins conspicuous. Inflorescence to 30cm, subsessile; male flowers with petals, obtuse; female with flowers, calyx to half length of corolla. Fruit to 2 x 1cm, ovoid, red to blue-black, edible. Assam to Burma. Horticulture. CANARY ISLAND DATE; CANARY DATE PALM. Trunk to 15 x 0.9m, solitary with oblong scars wider than long. Leaves to 6m, rachis sometimes twisted; pinnae crowded, regularly spaced along rachis, held almost in one plane. Male flowers 1cm; female flowers with calyx equalling corolla. Fruit 2 x 1cm, oblong-ellipsoid, yellow tinged red. Canary Islands. 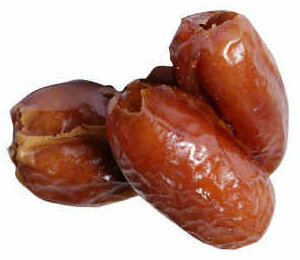 DATE; DATE PALM. Trunk to 30m, slender, suckering; petiole scars as long as wide or longer. Leaves to 3m; rachis rigid; petiole 20-100cm, with leaf spines to 15cm; pinnae 30 x 2cm, up to 80 on each side of the rachis, regularly spaced or clustered, rigid, dull green. Female rachillae to 40cm, calyx half as long as petals, petals 4 x 4cm; male peduncle to 60cm, bracts brown-scurfy when young, petals 8 x 3mm. Fruit 4-7 x 2-3cm, oblong-ellipsoid, yellow to brown; mesocarp thick, sweet, edible. A cultigen, probably originating in Western Asia and North Africa. ‘Abbada’: medium size, cures to black; ‘Barhi’ (‘Barhee’), small to medium, syrupy, very high sugar content; ‘Dayri’ (‘Dairee’, ‘Dairi’), medium to large, ripens to black, sweet, adapted to heavy soils; ‘Deglet Noor’, medium to large, semi-dry, sweet, late ripening, needing much heat to ripen, originated in Saharan oasis around the early 17th century; ‘Halawi’, medium to large, honey-flavoured, keeps well; ‘Khadrawi’, medium to large, meaty, rich-flavoured; ‘Medjool’, large to very large, needing thinning, very sweet; ‘Saidy’, large and broad, semi-dry, very sweet; ‘Thoory’, medium to large, dry, sweet nutty flavour, keeps a year or more; ‘Zahidi’, medium size, used as either soft or dry date, meaty and syrupy. Stems 1.8-4.5m, often clustered. Leaves twisted and reflexed; pinnae clustered in groups along rachis, waxy, rachis with brown persistent and pale deciduous scales. Male flowers to 5mm, petals obtuse; female flower calyx half length of corolla. Fruit red, 1-2 x 1cm. India to China. Stems to 9m, slender, clustered. Leaves spreading; pinnae paired, clusterd or in two rows, green above, white-waxy beneath, secondary veins 4-8 each side of a central rib, prominent, brown-scaly. Inflorescence orange; male flowers to 1cm; female flower calyx half length of corolla. Fruit 1 x 0.5-1cm, orange, becoming black. Bengal to Malay Peninsula, Andaman Islands. Stems to 3m, usually shorter, stout, covered in leaf bases. Leaves to 2m, crowded; pinnae rigid, held in differing planes along rachis. Inflorescence interfoliar; flowers cream. Fruit to 1.2cm, purple-black. South India, Sri Lanka. SENEGAL DATE PALM. Stems to 10m, slender, clustered, clothed with red-brown woven sheaths. Leaves to 2.5m, arching to decurved, often twisted; petiole 15cm, tinted orange, apparent petiole 50cm, armed with 6mm spines; pinnae to 25 x 2cm, up to 120 on each side, clustered in fanned groups, tattering, green, not glaucous. Inflorescence to 1.5m; flowers cream becoming brown, musty; male flowers 6mm; female flowers with ring-like calyx, half length of corolla. Fruit 1.3-1.7 x 0.9-1.3cm, pale yellow to red. Tropical Africa. MINIATURE DATE PALM; PYGMY DATE PALM; ROEBELIN PALM. Stems to 2m, slender, especially at base, expanding toward crown, often leaning, clothed above with old petiole bases, roots forming a basal mass. Leaves to 1.2m; pinnae to 25 x 1cm, around 50 on each side, grey-green, regularly spaced along rachis and held in one plane, drooping, silver-scurfy, especially beneath. Inflorescence to 45cm; flowers cream; male flowers 1cm; female flowers 5mm, calyx less than half length of petals. Fruit 1 x 0.5cm, ellipsoid, black. Laos. CLIFF DATE; WILD DATE PALM; INDIA DATE PALM; EAST INDIAN WINE PALM. Stem to 7m x 20cm, not clothed in persistent leaf bases. Leaves to 3m, often twisted about rachis, grey peltate-scaly on ribs beneath. Inflorescence to 1.2m, much branched, pendent; male flowers 1cm; female flowers with calyx half length of corolla. Fruit 2cm, oblong-ellipsoid, glossy yellow ripening deep purple-red. Himalayan India, Sikkim, Assam. WILD DATE; INDIA DATE. Stem to 15m x 30cm, scarred. Leaves to 4.5m, grey-green; pinnae to 45 x 2.5cm, arranged in clusters in 2-4 planes along rachis. Inflorescence to 90cm; male flowers to 1cm; female flower calyx half length of corolla. Fruit to 3cm, oblong-ellipsoid, orange-yellow, to purple-red. India.